i've seen these advertised in london......do we ever have any near/in manchester? this sounds like an excellent idea... who else is attending? 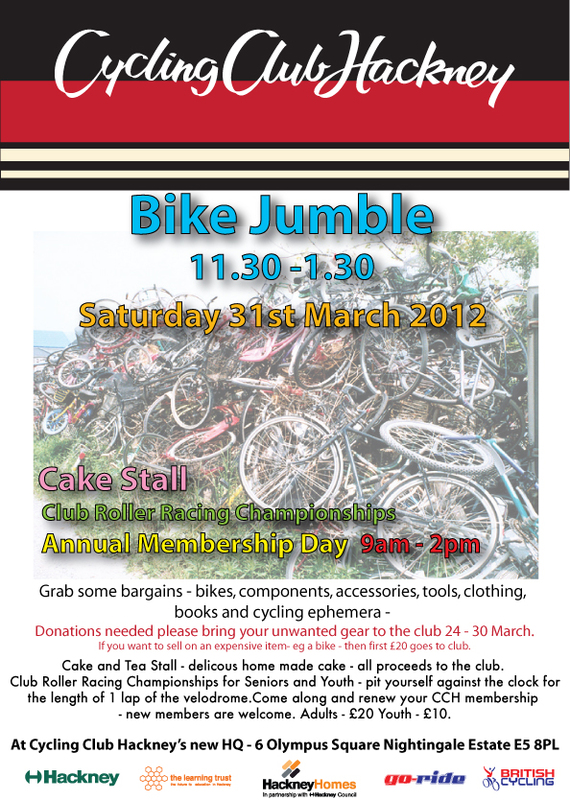 Cycling Club Hackney will be holding a cycle jumble 31/03/12 from 11:30 - 13:00 to help raise funds for the club. We do lots of youth development work as well as encouraging new riders of all ages and from all walks of life to gain experience and confidence cycling and we also support Cycling Uganda. This is a great casue so if you have anything to donate please let us know (PM me), and come along on the day for tea and cake and to sniff out a cycling bargain. Sure it's going to be good but it's a bit of a trek for a lot of us in Manchester, have you posted this closer to home too? Oops, this will be the wrong jumble thread then! in Newhey today,Kingsley Leisure Centre on Turf Hill Road??? Parrs Wood 9.00 5th May. Damn - missed it. Any others coming up soon? Any idea what time the jumble's on tomorrow? Apparently it was half 10. But most people had set up when I got there at 9:30. Most of the traders were running about buying stuff off each other before 10. So well worth getting there early next time. No entry fee either. Hopefully the weather won't be crap. Jumble at the Velodrome Sunday 20 Jan 2013. Good for a ride out , its an hour from Walthamstow, a bacon sandwich and a natter. Phone to book tables. Event soon - don't delay!!!!!! ^^ & ^ bit far from here, but Ta anyway. Ooooh, jumble and i've just purchased a new frame! What time is it on from/til?